48 Wall Street, known at one time as the Bank of New York Building was built in 1928 on land used by the bank since 1797, on the corner of Wall Street and William Street in New York City's Financial District. 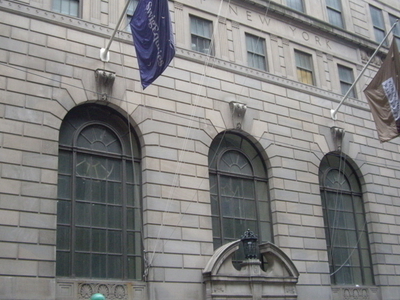 Its former banking hall has been modified to house the Museum of American Finance, which moved there in October 2007. Immediately outside is the entrance for The Wall Street subway station (2 3 trains) on the IRT Broadway – Seventh Avenue Line. Here's the our members favorite photos of "Key Buildings in New York City". Upload your photo of 48 Wall Street!